Can Renewable Energy Reduce California's Fire Risk? The Rim Fire, still smoldering in Yosemite National Park, is expected to be fully contained on Tuesday, six weeks after it started. The record-breaking blaze is calling attention to California’s overloaded forests, stocked with fuel after a century of aggressively snuffing out fires. Reducing the fuel load acre-by-acre is costly and runs headlong into a decades-old environmental debate over forest management. Now, California is making a new push to use forest fuels in biomass energy power plants, part of the state’s ambitious renewable energy goals. For U.S. Forest Service scientists assessing the Rim Fire damage on the ground, the case for tackling the fuel problem is becoming increasingly clear. “The trees we see here today aren’t going to make it,” says Forest Service Ecologist Carol Ewell, slogging through a foot of powdery, white ash amid seemingly endless stands of blackened tree trunks. The trees in this part of the Stanislaus National Forest are bare, with no pine needles and few branches remaining. “We use the word, it was ‘torched,” Ewell says. “The fire went all the way up the crown.” About 40 percent of the vegetation in the fire burned at this kind of "high severity" and is unlikely to survive, according to Forest Service estimates. 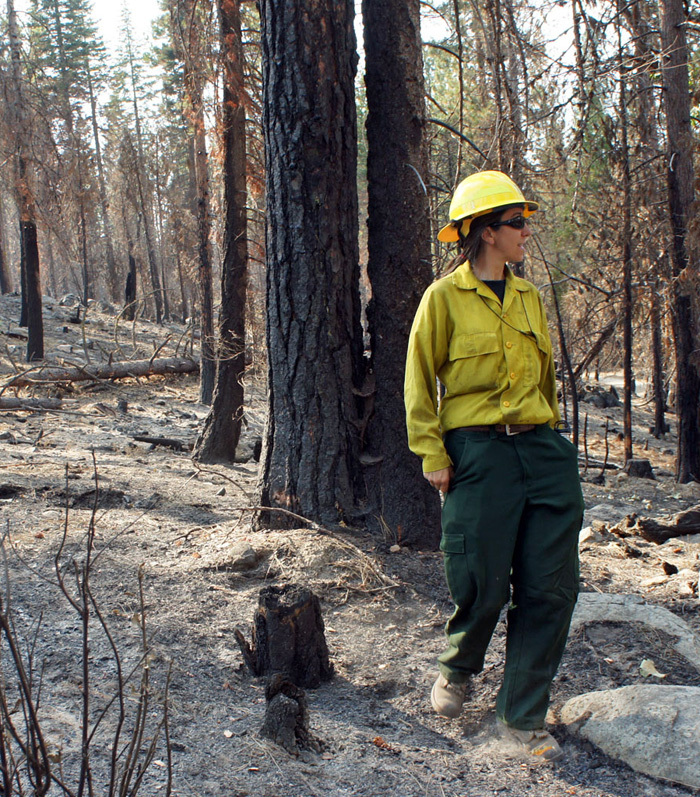 Ewell and Stanislaus National Forest fire planner Shelly Crook are doing some “fire forensics,” cataloging the damage to assess how past fuel reduction projects fared in the blaze. The dense trees in this stand, just three and four feet apart, remind Crook of a teenager’s bedroom. Historically, the Sierra Nevada saw more low-intensity burns that cleared out the understory every 5-to-20 years. Ewell says that stopped nearly a century ago, when the Service instituted its legendary "10 'clock" policy, the goal of putting out any fire by 10 a.m. on the day after it was reported. The Forest Service dropped that policy 30 years ago, but the legacy is still visible on the landscape. 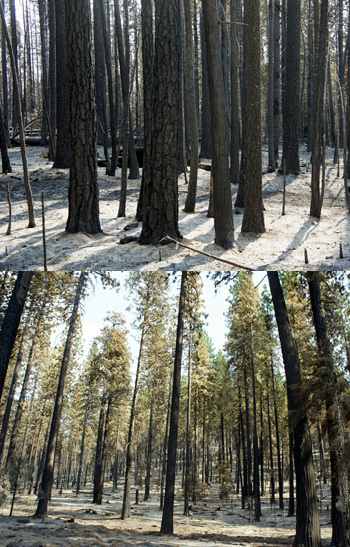 The Rim Fire used small trees like ladders, climbing upwards to create high-intensity crown fires that commonly leave just charred trunks behind. And yet, right across the road, it’s an entirely different scene. All the climate change modeling, everything predicts this kind of stuff to happen, and we have to do something about it. “I can see some really bright green, healthy needles showing through this canopy,” Crook says, peering upward. The needles at the base of the trees are brown, but green becomes increasingly dense farther on. The difference between two the plots, Crook says, is that one side of the road had been thinned out. The small trees were removed, leaving 10 to 20 feet of space between the larger trees. 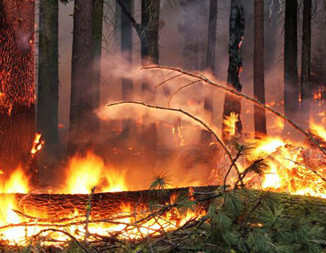 “The Rim Fire is like a wake-up call,” says Hugh Safford, regional ecologist for the Forest Service. 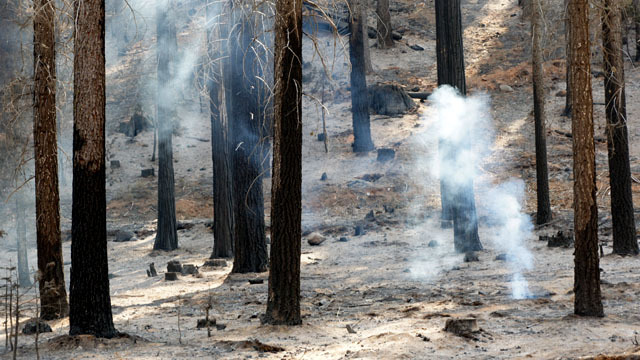 Safford says the best way to reduce forest fuels is to restore fire as a natural process. Forest managers have the option to allow some naturally caused fires to burn in remote areas or if they pose little threat of spreading. Fire officials saw the benefit of so-called “wildland fire use” when the Rim Fire slowed down as it hit areas inside the park boundary that had recently burned. Making the decision to let it burn is often more challenging for the Forest Service than for the National Park Service. National forests are often closer to developed areas and the agency juggles a number of internal priorities, including recreation, timber sales and hunting. Closer to development, the Forest Service focuses on prescribed burns and forest thinning, where small trees are taken out with machinery. It’s expensive work, running in the hundreds to thousands of dollars per acre. 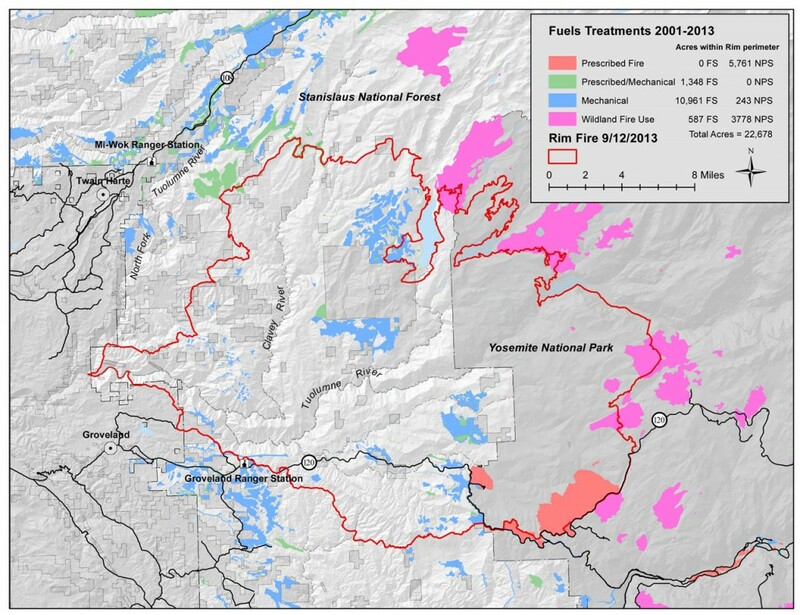 Only about 8 percent of national forest land within the Rim Fire perimeter had been treated in some way over the last 12 years. Contractors make their profit on the few trees that are big enough to use for lumber. But most of the material is too small, so it’s usually piled up and burned. People like Brett Storey say there’s a better way to handle forest material. “What you’re seeing right here, this is where the facility would be,” he says, pointing to a lot next to Placer County’s recycling facility, about ten miles northwest of Lake Tahoe. His hope is that next year, it will be the Cabin Creek Biomass Facility. “Whole towns get heated like this in Scandinavian counties,” he says. The power plant would be small compared to its fossil-fuel cousins, around 2 megawatts, enough electricity for about 1,500 homes. The facility would run on wood and scrap that’s normally piled and burned during forest thinning operations in the area. Storey says the Forest Service produces a ready supply within 30 miles of where we stand. “I kind of joke around - they have this ten-year plan and I call it my super-size menu because it shows what years, how much acreage and how much material they’re going to be taking out,” he says. California is trying to jump-start the market for similar projects. Last year, the legislature passed SB 1122, a bill that requires the state’s largest electric utilities to purchase 50 megawatts of power from small biomass plants that run on forestry material. That could add 15 to 20 new biomass projects in the state. The electricity is likely to be much more expensive than solar and wind power, but unlike those sources, provides a constant “baseload” supply. The California Public Utilities Commission is currently setting up conditions for the power contracts, which must be approved by the agency. “It helps us do more with the same amount of money,” says Larry Swan, a biomass utilization specialist with the Forest Service. Having a market for small forest materials could help the Forest Service treat 10-20 percent more acres, he says, if the power plant is within 30 miles. Beyond that radius, the cost of transporting and trucking materials often makes biomass projects uneconomical. Because [biomass plants] are relatively new, people are a little afraid of them. The Cabin Creek project was originally proposed for a site in Kings Beach, closer to Lake Tahoe, but the local community was fiercely opposed. Environmental groups also took a stand. “You can call it thinning, but thinning is really logging,” says Kevin Bundy of the Center for Biological Diversity. Then there’s question of climate change – whether the carbon currently stored in the forest goes into the atmosphere or stays in the trees. New trees will eventually reabsorb that carbon, but Bundy says the climate can’t afford even a short-term increase in emissions. The Center for Biological Diversity opposed the Cabin Creek project, though the group entered into negotiations with Placer County. Bundy is currently opposing a similar project proposed for North Fork in Madera County. Back at the remains of the Rim Fire, signs of life are appearing. “Ants survive!” exclaims Shelly Crook, spotting an ant colony emerging through the layer of ash. Recovery will take decades, she says, but she’s hoping the lessons from the Rim Fire will be taken to heart long before then.